Or read all the words below! For many years of the RBRR we have offered the following notes to all crews as a guide for the preparation of the crews and cars. The following notes are offered as tips to help crews preparing for the RBRR. This is a fairly arduous event covering approximately 2000 miles in 2 days and 2 nights. In order to finish comfortably it is a good idea to spend some time preparing both yourself and your Triumph and it is best to start the process EARLY. Inevitably a few crews always arrive at the start looking absolutely tired out as they have just spent the last few days and nights preparing the car, this is without being too harsh just plain daft. Get the car prepared weeks in advance! To help you with this we have produced a list of pre-event checks and advice based on years of collective experience! Attempt to get some good sleep prior to the event; take some time off work a day or so before the start. It really is important not to start the event tired; save that for the end! Many crews cannot sleep on the first night as adrenaline has kicked in, therefore lack of sleep before the weekend can result in the Saturday night / Sunday morning being very difficult especially around the Exeter and Bodmin section. It is most important to realise the difference that two proper nights sleep makes, and why the challenge of the RBRR, when the only sleep available must be obtained in the car, most likely on the move, should not be underestimated. Despite the natural excitement of the first night's drive, particularly for first timers, it is important to try and get some sleep. This will stand you in good stead for the Saturday night when some of the driving is less demanding and therefore potentially more soporific. · Do remember to have a break if you feel tired while driving. Club Triumph does not advocate driving whilst tired. · Remember that the RBRR is not a race, whilst there is no need to rush to the stops or feel under pressure to hare around the route, it is important to keep up with the pace of the RBRR. Drive with consideration and care for all other road users. · Attempt to get to the start with plenty of time to relax, chill out and possibly have a snooze, rushing about can be stressful! · A Prawn Vindaloo the night before the start may be best avoided – you may be fine, however what about your co-driver(s)! · Take a change of clothing and shoes with you. · Wear flat soft shoes, as these give better pedal feel. · Take a waterproof jacket. · Take a high visibility waistcoat, useful if you breakdown on a fast stretch of road. · Your personal “first aid kit” should include headache tablets, indigestion tablets (e.g.Rennies), and immodium or similar. · Loo roll - enough said! · Take a car blanket or sleeping bag, a pillow, sun-glasses and a hat. · An eye shade is handy to eliminate glare from oncoming headlights and assist passengers to doze off. · You may also find ear plugs helpful in this regard; it's amazing how they make the Spitfire or TR sound more like a Jaguar. These can be purchased from, supermarkets, DIY or construction equipment stores. · Take lots of drinking water. This is much more refreshing and better at quenching your thirst than a fizzy drink. Some crews take Pro-Plus or Red Bull with them, others just drink copious amounts of coffee, try and drink water instead. · There’s no point taking too much food, but some fruit (especially bananas), and snacks are not a bad thing. Remember that food is freely available at some of the control stops. · The start of the RBRR is at ‘The Plough’ public house. They do good food, however do not go ballistic as this will bring on premature tiredness, plus other detrimental side effects! Please note that the organisers will not wish to see these, but you will be asked to sign a declaration to confirm that they are in place and current at the time of the RBRR. However, if you have them with you and you are stopped by the Police it could save a journey to your local Police Station when back at home. 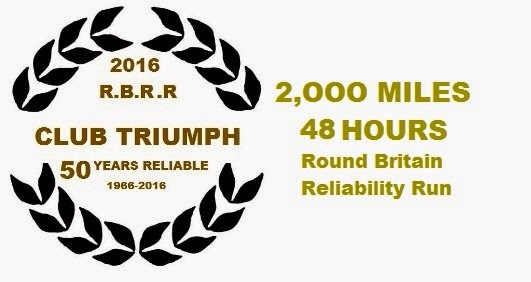 · Club Triumph RBRR Road Book. Absolutely essential!!! · Mobile Phone plus charger (The one that uses the number that you issued on your entry form). Yes, essential! · Clip board (should be cardboard, nothing stiffer, to reduce injury potential should the unthinkable happen). · GB ring bound Atlas; Route highlighted, do make sure highlighting can be seen under torchlight! A very good road atlas is the Philips GB Road Atlas A4 sized (isbn no. 978-1849-073721) This is a spiral bound book that has speed camera positions marked. Consider reducing the number of pages within the book, no need to for the gazetteer etc. Also mark onto the map the control stops and the times they are open. By highlighting the route before the event you will effectively learn some of the route, making the navigation easier. If using an open topped car, take a plastic cover for the map and road book. Good sources for these are outdoor activity shops such as Millets. Again essential! · Pens/2B pencils and paper, an eraser is handy if you use pencils. Pack the car so that tools and emergency equipment can be easily reached when needed, be logical. · Make sure you can get to the fire extinguisher (if fitted) EASILY from the driver’s seat. Remember your reach may be restricted by your seat belt. · Remember not to place too many items behind the passenger seat. You may well want to recline it when you are sleeping or resting. · Arrange things so that the driver can get a drink and a snack even if all the other occupant(s) are asleep! 2015 comment. : This event attracts the full range of Triumph cars from the humble Toledo and through to Works Spec rally cars with just about everything else in between. Their condition varies from concours through to daily hacks, again with everything else in between. It is also worth noting that the MOT Test in the UK is the Absolute MINIMUM level of Roadworthiness needed for a vehicle. This event is enough of a challenge without the car misbehaving as well . Go through the your car with a fine toothcomb - inspect everything and if in doubt,renew it..
To start with the basics, if the vehicle is in regular use, is regularly serviced and maintained and you know of no unresolved gremlins in the works you should be fairly confident that all will be O.K. (in so far as you can ever be). If, however, the vehicle is not in regular use then it is prudent to service and check the car very thoroughly (or get someone else to) well before the event and apply higher standards than for normal daily use. It’s always better to fix it BEFORE it breaks. Particular care should be given to components which may “run hot” such as bearings, brakes, engines and transmission components. · Is a service due? It would be a good idea at least to change the engine oil and filter before you start; remember you’re going to do 2,000 miles. Check the gearbox, rear axle and power steering levels too. · Check the brake shoes and/or pads. Some parts of the route can be quite hard on the brakes. Make sure your linings are of good quality and that there’s enough pad material to last the distance. If possible fit Mintex 1144 linings. How old is the Brake fluid? If unsure – change it . · Check the cooling system, paying particular attention to the hoses, are they still flexible or have they gone hard? If so, replace the hoses and the clips. The steel pipe under the manifold on 4 and 6 cyl. engines is well hidden and prone to corrosion , change the olive as well. Stainless steel replacements are commonly available from Canley Classics/Moss/ Rimmer Bros.
· Check all brake, fuel, oil, vacuum and air hoses/pipes and all their unions. If in doubt, replace. Pay particular attention to their routing both in the engine compartment and under the car and make sure they do not chafe anywhere. On fuel injected cars, pay particular attention to the injector leads-They harden with age and become brittle. · Check out all the electrics, including the ignition system..Pay particular attention to the light switches and their connections. Remember up-rated bulbs put an increased load on the system. On leaving the start your lights may be on for 38 hours. We have seen crews rig up bypasses for burnt out switches on the side of the road by torchlight- not an easy task . · Headlamp alignment: On recent RBRRs the advent of powerful HID xenon lamps has caused problems with dazzling other entrants from behind. Please ensure that if fitted that they are correctly aligned taking into account the possible nose high attitude of your car once fully loaded for the event. · For those earlier cars still with dynamos, remember that electrical demands will be higher than usual for long periods so it's worth checking that the charging system is in the best of order and the charging rate correctly adjusted. Check the dynamo brushes. Check the electrical connections to both dynamo terminals. On the 4 cylinder TR engine and possibly others they are very near to the exhaust manifold and over time the heat stress can cause fatigue and eventually breakage. New Terminals and bullets available from online sellers such as http://www.autosparks.co.uk/. · Check carefully all round the fan/steering pump belts looking for splits. It's much easier to replace in the relative comfort of your garage rather than in the early hours somewhere, possibly in the pouring rain. Remember that if you do fit a new belt just before the run you should check the tension at the first control halt since a new belt will certainly stretch and will need tightening to maintain the charging rate. · Windscreen Material- If your Triumph still has toughened glass consider changing to a laminated screen. Back in 2010, one unlucky entrant had his toughened screen shatter in the far North of Scotland and a subsequent very long ride home to London on various breakdown trucks. · Check the windscreen washers and wipers. Pay special attention to the condition of the wiper blades to ensure they have not perished.Also consider the condition of the wiper Rack and Wheelboxes- which may work but have a lot of wear in them . · Check the suspension thoroughly, examine the bushes, mounting points and dampers. · Parts of the route are quite twisty (and fun), if you are considering fitting new Dampers consider Koni’s. The price premium is worth paying. · Steering- Check Track rod ends, column UJ and gaiters. The UJ on the steering column are buried right near to exhaust manifolds and can run dry or get oil contaminated, replace if looking dodgy. These UJs are freely available from Triumph parts suppliers. · Check the condition of the exhaust system, pay particular attention to the clamps and hangers. We have had recent retirements, basically due to a sheared rubber and subsequent broken pipe. · Pay particular attention to rear hub bearings and UJs. They will put you out if they fail. Fit good quality Hardy Spicer universal joints. Many crews have suffered vibration problems on their cars caused by worn joints and out of balance components. · Whilst Vibration may not cause you to pull out it may make for a difficult weekend . Assess, Inspect and Balance if unsure Propshaft , Wheels ,driveshafts , Quill shafts (and Nosepiece Bearings on the Stag/Saloon) and Roller top Mounts on Struts. · Spitfire / Herald / Vitesse/GT6 variants have been affected recently by rear hub bearing problems, make sure they are greased up and are running quietly. · Engine and Gearbox rubber Mountings perish with age- check and replace if unsure of age or condition. · Are there any repairs outstanding? Will they REALLY last? · Clean and polish the car. We are serious, the car will look better, you will feel better, and the stickers will come off more easily! · Thoroughly clean the inside of the car, and take a rubbish bag with you to collect up food and drink cartons when the contents have been consumed. A tidy car must be more pleasant to live in for 48 hours. · Make sure the windscreen and all glass is clean inside and out. You will be surprised how dirty they get inside! Remember you'll be doing a lot of night driving, and a clean screen really does help. Think about taking the window cleaner with you, clean the windows when you have a spare moment. Meguairs make a very good one that smells of coconut, very good at shifting bugs etc. Bay wipes (Buy non-fragrant, the other types can turn stomachs!) are also good at this function. · A Copy of the wiring diagram for your car, could be useful when attempting to trace a fault. Also a list of basic tuning info., sequence for adjusting valve clearances, ignition timing etc. One other note: At the start before leaving, find time to check fluids, tyre pressures, wheel-nuts and give the car a visual once over, just to ensure nothing is obviously wrong. It might be an idea to carry out some form of similar procedure at the control stops, remember the car may well be working harder than you! · Fit better lighting; many miles will be covered at night, most on unlit twisting roads. · Fit relays to your existing headlamp circuits to reduce the load on the switch and/or dipswitch. Remember: “Lucas, prince of darkness”, it’s nice to be able to see where you’re going! · For those cars with H4 bulbs, consider replacing the standard ones with Osram Silver Star or similar, these offer a longer reach on main beam and better spread on dip. · Fit stiffer springs and dampers; extra weight is likely to be carried and bumpy, twisting and undulating roads are being used. Don’t make it too hard though, you’ve got to sit in your car for 2,000 miles and comfort is a good thing! · Fit better screen washers and wipers. Rain is very likely (especially on Saturday morning in Scotland and, of course in Wales); think about applying Rain-Ex (or similar rain repellent) at the start and during the event. · Change the seats (especially the driver’s seat) for ones that are more comfortable and/or supportive, as you are going to be sat in them for 48 hours. If the car is not fitted with a passenger reclining seat, source one from another suitable later Triumph, e.g. early Spitfire/GT6 use late Spit. seats, Herald/Vitesse use Dolomite seats, etc. · Add fused cigarette lighter socket(s) to power any auxiliary equipment such as satnav., mobile phone charger, cooler box etc. (These sockets are available at motor factors at reasonable prices). · Consider fitting a map light that has a flexible stalk; ‘Demon Tweeks’, ‘Holden Vintage and Classic’ and ‘Don Barrow Rally Equipment’ are good suppliers. Fit it in a position that will illuminate the maps for the navigator, but will not distract the driver. You need to think very carefully about which spares would be useful, rather than just dead weight. Take such spares and tools as are appropriate to the event and to YOUR level of competence. More experienced mechanics may choose to take spares with them which would take longer and be more difficult to change, such as wheel bearings, water pumps, even drive shafts. But don’t take a spare clutch if you normally draw the line at changing the oil and filter. The roadside is not the place to learn the black art of motor repair. An AA membership card (or similar) can be a very valuable spare in itself, know when to quit and let someone else do the job! Recent RBRRs have been blighted with problems caused by duff dynamos, alternators and fuel pumps. Think about taking replacements, however talk to entrants using similar cars and share the load. A note for first time RBRR or long distance driving event entrants. Prior to the event It may be beneficial to pack your car fully with ALL the gear you intend to take along with your co-drivers and take the car out for a run, preferably at night . Get a feel for how it handles and and get the inside organised with your maps and storage etc. There is nothing worse than ferreting around looking for wallets, phones, cameras down the sides of seats which can be especially distracting for the driver. Make sure you have adequate means of payment with you, just in case the unexpected happens, have your escape plan worked out BEFORE you need it. · Light switch(es) – especially the combined indicator / dip switch (Stag, 2000 range, and others) and the TR light switch. · Water (for cooling the PI pump, of course). If you are taking water for the cooling system top up why not take water/antifreeze mix. · A brake hose clamp could isolate a wheel cylinder and avoid excessive fluid loss or bleeding. · If your car has security type locking wheel nuts check the special nut/key is readily to hand. Better still remove them and fit standard nuts! Right, that’s the spares list done – now for the tools! Instead of packing your tools in a rusty metal toolbox, why not use a plastic one? These are lighter and absorb rattles better. Keep a small selection of frequent use tools such as pliers, screwdrivers, 7/16, 1/2, and 9/16 AF spanners near to hand. · A plastic or foam sheet to lie upon if you have to go under the car- available from camping shops. · Crimping tool, these offer much more positive connections than ordinary pliers if you need to make low resistance electrical connections. · Strong, stable screw jack – a trolley jack is a very good idea if space available-think about the weight though! We cannot over emphasise how important it is to prepare for this event in plenty of time, think logically and sensibly! All the above can help to make the event good fun, it would be sad to retire because of the failure of a small part. If in trouble, remember the RBRR maxim of having the bonnet up, if down other crews will presume that you are having a snooze! Do remember that the objective of the event is to complete the run, do not worry about asking for help, we are lucky in that the event attracts many Triumph experts and surely we all want as many crews as possible to finish. That's it, have a great weekend's motoring!